The classroom management poster I did in my classroom management class was done my junior year. We had to create a poster board that had classroom strategies that you implement in the classroom in the future. 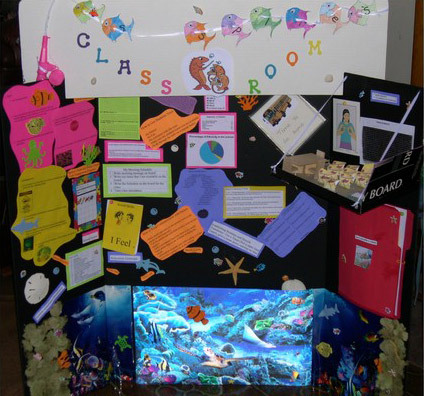 With my poster board I created a classroom theme of an ocean. My second artifact is a motivation to get one of my students during student teaching to do her work. We have allowed Angel to have a necklace for her good work and behavior. If she does not then we take the necklace away. Of course, she can always gain the necklace back with good behavior. I learned a lot of skills and strategies that could be used to help manage the behavior in the classroom. From learning about all the strategies, I was able to choose what strategies I would like to have in my classroom. I learned about motivation techniques which is partially how I learned more about using jewelry to motivate Angel to follow directions and do good work. Motivation is key to teaching. A lot of the time students have the skills and and knowledge, it just requires conceiving the students to do the work so that the students may further their education. I feel that my classroom management poster fits the standard because it contains strategies related to the learning environment which needs to have structure and behavior management strategies set in place. I feel that a teacher needs behavior management strategies put in place in the class to help teach and manage the classroom. My second artifact fits best with the standard of learning environment because it relates to understanding of individual and group motivation. This artifact fits best with the individual motivation that is set in stone for Angel. This artifact could be used to form structure in the classroom, to manage behavior and hopefully to make a my day a bit smoother. You know what to expect from your students and your students should understand what you expect from them. It is very important for a teacher to make sure the students understand the expectations that have been laid out for them. I hope to use the same type of plan as shown in the second artifact to help motivate students and to be use it as a guidance tool for different things you can use to motivate a student.